They say that true success is not in employment, but in having your own business. And yes, many entrepreneurs have proven that doing business is actually more profitable than getting employed into some company. There are countless successful entrepreneurs worldwide and they continue to grow in leaps and bounds. Most entrepreneurs don&apos;t have to be successful as the ones you may see on the show "shark tank" or "the profit" or anywhere else for that matter. Most did not even graduate from college and manage to hit big in the field of entrepreneurship. And although people also do hit big in employment they are often limited by what a job can do in the way of growth, creativity, and financial gains. This is why most choose the profession of entrepreneurship and this is why this book is written. When you decide to make a decision like choosing your life’s work, you have to consider what you are going to be doing, because at times, it is a choice that you decide to take and a journey that will shape your life and your future as well as those around you. That&apos;s why entrepreneurship is often called a "journey" and a "calling". Because when you take the first step it is a "leap of faith" and a hope that you will see the vision you desire become a reality. There are no guarantees. Entrepreneurship is a profession and a responsibility at the same time. A responsibility to the community and world around you as well as yourself. This profession called entrepreneurship, is rewarding as much as it is a tenuous ride. It is a ride worth taking and a decision to say yes to many possibilities as well as uncertainties. Is it worth it you may ask? Yes. I believe the world turns and becomes possible when entrepreneurs decide and do what they know that they ought to do. It&apos;s a wonderful experience! Simply put, why limit yourself and your life when you have the endless opportunities at your fingertips as an entrepreneur. If you&apos;re "on the fence", then take a peak at what entrepreneurship is all about, you may find it interesting. 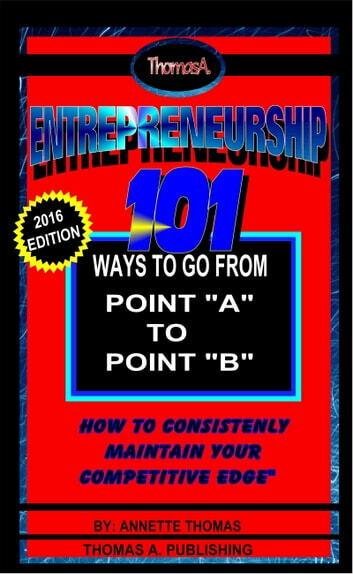 In this e Book, you will find 101 unique tips that will help you achieve success in doing business. Whatever your chosen industry is, this is the book to read and one that can change and encourage you! 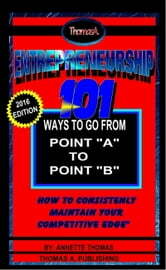 Books related to Entrepreneurship: 101 Ways To Go From Point A To Point B, "How To Consistently Maintain Your Competitive Edge"
The Secret Is Selling Not Closing. Closing Is the Result of Effective Selling.